You pull into your driveway and reach for the garage door remote only to notice it’s no longer in the usual spot. You’re certain you saw it clipped to the visor when you left the house, but now it’s nowhere to be seen. You frantically search your pockets and car seats and sweep the entire interior of your car — only to turn up empty-handed. Whether you went on a quick run to the grocery store or spent the whole day out driving, it only takes a burglar a matter of seconds to steal your possessions. Increasingly, thieves are getting wiser and smarter in their methods of entry into homes. Stealing garage door openers are one common method implemented by burglars desiring easy access to homes. Once an individual has found your garage door opener, they can usually find your home address or location by finding your car registration — revealing all your personal information. Don’t panic just yet. By following a few steps and taking precautionary measures against future robbery, you can ensure your garage — and home — remain safe and sound. Your first course of action should be disabling your stolen garage door opener to prevent the controller from operating. Find the colored Smart Button located on the motor housing inside your garage. Usually, these dots will be green, red, orange, yellow or purple. Press and hold the button in for several seconds in order to void all remotes currently connected to your house. Deprogramming your remote will ensure any potential burglars will be unable to access your home. Once you’ve disabled the remote, your next course of action is reprogramming your garage door’s system. Locate the manual that came with your garage door to find the proper directions for your system. If you misplaced or lost the maintenance manual, skim the manufacturer’s website for the necessary instructions on reprogramming. Monitor your garage door wirelessly in the future for added security. At Ole and Lena’s Garage Doors, we supply the latest technology on the market to provide you with that much-needed added peace of mind. LiftMaster’s MyQ technology is designed with remote access to your garage, so you gain a view of your home anytime, anywhere. Invest in a safer, more efficient future by equipping your garage with the technology it deserves. You certainly don’t want to experience the panic of a stolen garage door opener ever again. To prevent future misplaced or stolen remotes, remember to implement a few precautionary measures. If you’re accustomed to leaving your remote clipped to your visor, get in the habit of keeping your controller in a safer place that is more out of sight. Try keeping your remote on your keyring instead so you can keep an eye on it at all times. Remember to always lock your doors, even when you make a quick run someplace you don’t intend to stay long. Burglars don’t just target specific places — they strike when you least expect it. Never leave your remote or registration in plain sight, either. In the future, use the latest technology on the market to prevent a disaster from striking again. At Ole and Lena’s Garage Doors, we suggest LiftMaster’s MyQ technology for certainty and security in the future. Ole & Lena’s Garage and Entry Door Service provides garage door repair service and garage door replacement throughout the Twin Cities Metro area. 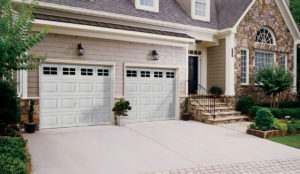 We provide new garage doors as well as garage door repair service in Bloomington, Minnetonka, Eden Prairie, Hopkins, Edina, Richfield, Minneapolis, St. Paul, Plymouth, Savage, Burnsville, Shakopee, Apple Valley, Eagan, Maplewood, Oakdale, Woodbury, White Bear Lake, Lake Elmo, Mahtomedi, and throughout the Twin Cities metro and Minnesota.